Emily Rodgers draws influence from such diverse places as 60s garage rock and folkie lo-fi technicians like Iron & Wine. 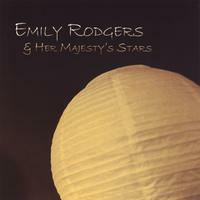 Emily Rodgers & Her Majesty's Stars have shared stages with Jolie Holland, Magnolia Electric Company, Great Lake Swimmers, and Nina Nastasia. Not having her officially pressed CD yet in hand, songwriter Emily Rodgers gave out a burned copy of her eponymous debut album, its cover adorned with a stark rubber-stamp graphic of a single leaf. That sparseness lends itself well to the music she has recorded with Josh Roman's Mindrocket studio in Sharon, Pa., a brand of post-rural, ethereal alt-country drenched in primo melancholy and reverb. Rodgers lived in Georgia until she was 5 ("which may account for the fake Southern accent," she says), but spent her formative years in the Chicago suburb of Elkart, Ind. After attending the Mennonite college in nearby Goshen, she moved to Pittsburgh a year after her cohorts Susanna Meyer and Hallie Pritts (both members of country-folk band Boca Chica), and has taken up residence with them in Highland Park, as well as common cause with such local folk artists as Kevin Finn and Megan Williams. "In college, I listened to a lot of Gillian Welch," Rodgers recalls of her earlier influences. "And I had a radio show, which during the day was classical, and in the evening, folk music. We would always go down to Merlefest, that big Doc Watson bluegrass festival in North Carolina." Nowadays, for inspiration Rodgers faces away from the boomer-folk camp and more toward the indie-leaning elements of the roots scene, such as Julie Doiron, Richard Buckner, and Bonnie Prince Billy. "I started writing songs when I moved here in 2003," she remembers. "I had an apartment all by myself, and it was my first time being where no one else could see or hear me. Some space opened up in my brain that I didn't know I had because of that solitude." With the band Her Majesty's Stars -- which on record includes Williams (violin), John Paslov (guitar/bass) and Andrew Rishikof (drums), but in a live setting has sometimes featured bassists Meyer and Erik Cirelli, and drummer Dan Baselj -- Rodgers has carved out a shining niche. But while singing, she also confounds her listeners with an impenetrable accent that makes her lyrics a bit indecipherable. "I get a lot of Innocence Mission comparisons, and Kevin [Finn] says I'm like the female Michael Stipe," she jokes. "But honestly, I don't fall into this drawl on purpose. I guess I sing sounds more than I sing words." Along with comrade Finn, Rodgers and her band recently packed Philly's new World Café venue before WYEP (which plays the syndicated Café program here) had taken any notice of her. Once the CD comes out, though, that might quickly change, especially with the up-tempo twang-rocker "Last Call" slipping easily into a Natalie Merchant-soaked rotation. "Recording this album was a really good first experience," she affirms. "It made me think more about arrangement. I became more of a producer than I thought I ever could be." The CD is a fantastic working of bare bones, real, heartfelt indie-folk. These songs are reflections of the human condition. This is a great CD. Emily's voice is haunting and the accompaniment is wonderful.